When it comes to guitar effects pedals, there is rarely a brand more popular than Boss. Their products offer a perfect combination of simplicity, quality and performance. 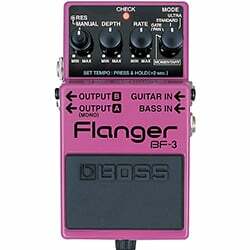 That is why Boss BF-3 is one of the most versatile flanger pedals on the market right now. Let’s take a closer look. Despite its rather ordinary appearance, Boss BF-3 is packed full with various features you don’t see that often. For starters, they have made it compatible with bass guitars by including separate inputs for this instrument. On top of that, the variety of modes is pretty interesting. This latest iteration of flangers from Boss features Ultra and Gate/Pan mode, which weren’t available before. One of the more interesting features has got to be the tap tempo. You can activate it pressing the foot switch and holding for some two seconds. Having the ability to set a tempo makes using a flanger so much easier in the long run. On the exterior, things haven’t changed much at all. We still have that bulletproof enclosure most Boss pedals share, combined with quality mechanics. 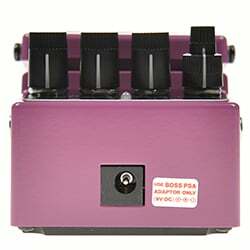 If there is one pedal design you can trust no matter what, it is what Boss offers. By using a template enclosure, Boss sometimes runs into trouble with controls. More specifically, they have to resort to dual purpose knobs due to lack of space on the chassis. BF-3 is one such example where we run into multi functional knobs. Going from left to right, we see a resonance/manual knob that defines the range of the flanger effect. Next comes the usual pair of depth and speed knobs, while the last control is the mode select knob. First mode available is the Ultra, which more or less adds a tangible edge to the flanger effect. Standard is the default setting, while Gate/Pan mimics something close to a tremolo. Lastly, there’s the Momentary mode, which means that the pedal will be activated as long as you are pressing the foot switch. With the addition of a tap tempo, it isn’t hard to figure how flexible BF-3 is. When the time comes to plug everything in and actually use the pedal, the results are pleasing to say the least. 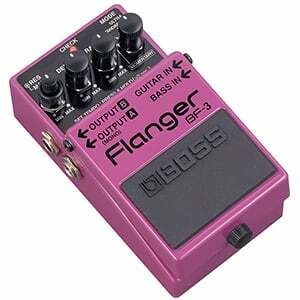 Sure, it is a digital flanger but Boss really invested a lot of effort to perfecting the tone you get from BF-3. It isn’t as organic as an analog one, but it is close enough. Dialing a good setting is almost too simple. There will still be some effort required to find a tone to match your needs, but with tap tempo you won’t have to worry about the rate being out of sync. Last but not least, we have to touch upon those bass guitar inputs. Using guitar effects with basses is a hit or miss deal most of the times. The fact that Boss went on to include dedicated bass inputs is eliminates most of the guesswork from the equation. That makes things much easier. At the end of the day, Boss BF-3 comes across as a no-nonsense flanger that packs a mean punch and lots of range. The performance definitely matches the versatility, making for one fairly wholesome flanger. At this price point, you will be hard pressed to find something considerably more versatile. For more info about the Boss BF-3, click here.